The Audi Q5 has been at the cutting edge of compact SUV design for ages, and the 2018 model looks to stay in that position. 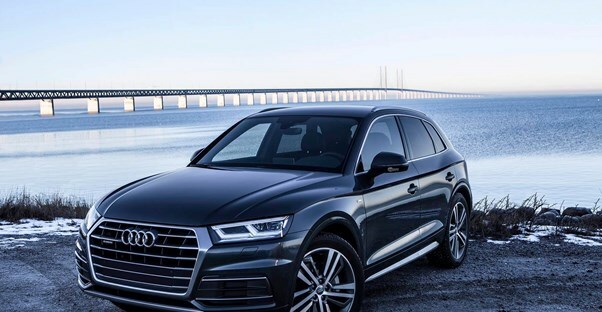 The new Q5 dropped 198 pounds while increasing its width by half an inch wider and elongating by 1.3 inches. The innovative all-wheel-drive drive system actually only runs in front-wheel-drive mode until a situation calls for greater traction by the rear wheels. This helps you save on gas used by the 354-hp 3.0L turbocharged V6 engine. All these changes add up to a #1 overall SUV ranking from U.S. News & World Report and a #2 overall SUV ranking according to Kelly Blue Book's customer ratings. The 2018 Audi Q5 has a starting MSRP of $41,500. After a complete redesign in 2017, Honda focused on refining the perennial best-seller for 2018. Thanks to these upgrades, the 2018 Honda CR-V has been handsomely rewarded with accolades, from Motor Trend's SUV of the Year honor to ranking 4th on Car and Driver's best SUVs list. Reviewers say that even though this vehicle is classified as a compact SUV, it still has 75.8 cubic feet of cargo space. The CR-V also has five comfortably sized seats with an abundance of legroom, not to mention heated front seats and a dual-zone climate control system. True to Mazda's "zoom-zoom" tagline, many reviewers have said that the compact crossover CX-3 is without a doubt the most fun to drive. Thanks to it being a crossover (utilizing a car platform with the height of an SUV), the 2018 Mazda CX-3 drives more like a sports car than its more off-road-oriented utility cousins. This vehicle starts at only $24,150, seats five passengers, and has 47.1 cubic feet of cargo space with the rear seat folded. The CX-5 also boasts a Bose Surround Sound System with nine speakers, so all passengers will have quality entertainment no matter where they’re seated. These features, together with its drivability, earned it first place on Car and Driver's ranking of all SUVs. The BMW X3 sports an all-new design for 2018. The overall aesthetic isn't drastically different, but sharp-eyed buyers will notice horizontal, rather than circular, foglamps that are now LED. The rear taillights are also LED and have undergone subtle stylistic tweaks. Additionally, the 2018 X3 features twin tailpipes for all engines. Under the hood, this new generation is capable of housing plug-in hybrid engine technology, a quick-growing market thanks to luxury manufacturers desire to chase Tesla's success. The 2018 BMW X3 ranked first in Edmunds rankings of SUVs based on its handling and available options for the starting MSRP of $42,650. Plus, the Alfa Romeo Stelvio's double-wishbone front suspension and patented link axle design in the rear purport to offer the same control and power that you’d expect from the supercar manufacturer. With a starting $41,995, the 2018 Alfa Romeo Stelvio led Kelly Blue Book's customer review ranking of SUVs.